Congratulations to Raveler mmmgood304, who won this month's giveaway for a Chunky Mesh Wrist Warmers kit! We'll be in touch with you shortly to arrange for the delivery of your prize. Our previous blog post featured a free pattern to knit a quick pair of mitts using our Jumbo Birch needles and two skeins of Briggs & Little Super Yarn, and we promised a freebie for our fans who crochet in this week's blog post. These simple mitts are very easy to customize for a variety of hand sizes and stitch up ultra-quickly using just 1 skein of Briggs & Little Super Yarn and a Jumbo Birch crochet hook. 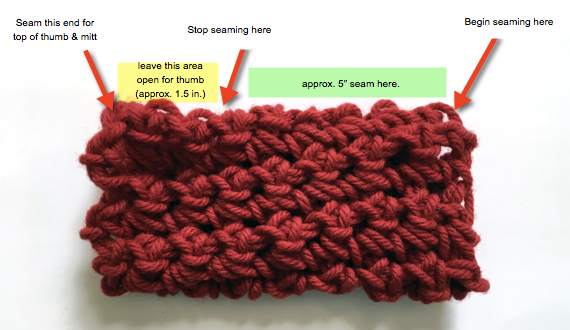 About this pattern: A bulky weight yarn is worked with a larger hook size to product a mesh-like single crochet fabric. What makes this yarn special is the story: Briggs & Little is Canada's oldest woolen mill and produces premium yarns spun from 100% domestic wool, and is milled, carded, dyed, and spun at their factory in York Mills, New Brunswick, Canada. The finished mitts will be very stretchy, so be sure to knit the size that is approximately an inch smaller than your desired hand circumference. Don't be alarmed by the size and shape of your project while it is being knit - the magic is in the blocking! 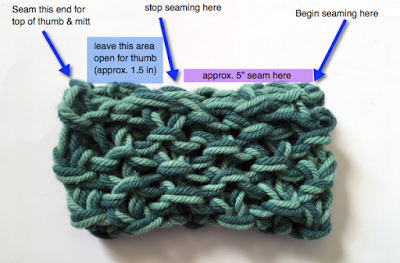 Ch 9 and work single crochet in 8 sts, beginning with second ch from hook. Single crochet all rows until piece measures 6 inches from start. For your final row worked once you have achieved your intended length, slip stitch in final stitch, snip your yarn end leaving several inches for seaming, and pull through to secure yarn end. How to get a custom fit: If you would like to create mitts with a larger or smaller circumference, you can add or subtract rows here - just be sure to take into account the notes above regarding negative ease and gauge when blocked. With wool needle or tapestry needle, seam five inches of cast on and bound off edge together; leave the next 1.5 inches unseamed for thumb; tack the opposite edge together for top of mitt. Wash your mitts in your favorite wool wash and lay flat to dry on Knitter's Pride Blocking Mats. 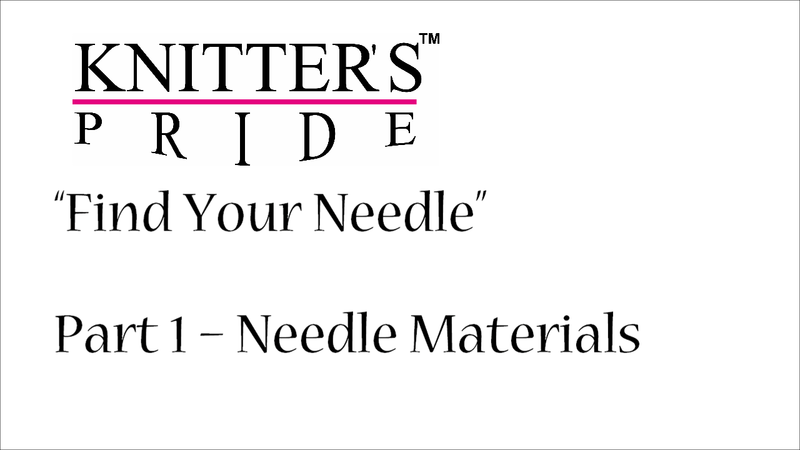 To achieve stated dimensions and neat edges, use Knitter's Pride Knit Blockers as directed in our previous blog post, found here. The holiday countdown has begun! We don't want to scare you, but if there are still a lot of names on your "knitworthy" list this year, consider this: there are only 6 Fridays until Christmas and Hanukkah. Now is the time for chunky quick knits! Today, we share a simple pattern to make with our Jumbo Birch needles and two skeins of Briggs & Little Super Yarn. You can whip these up in just one evening of knitting, and the pattern is very easy to customize for a variety of hand sizes. For our friends to crochet, we will be sharing a free crochet pattern later this month right here on our blog. About this pattern: Yarn is held doubled throughout. What makes this yarn special is the story: Briggs & Little is Canada's oldest woolen mill and produces premium yarns spun from 100% domestic wool, and is milled, carded, dyed, and spun at their factory in York Mills, New Brunswick, Canada. With yarn held double, cast on 6 stitches. Row 1 (RS): *k1, p1, rep from * to end. Row 2 (WS): *p1, k1, rep from * to end. Repeat these two rows of seed stitch til piece measures 7 inches from cast on. How to get a custom fit: for a smaller hand circumference, work fewer rows here; for a larger hand circumference, work more rows. If you are achieving the stated gauge, each two-row repeat will add or subtract and inch from your intended circumference. Once you have achieved your intended length, bind off all stitches in pattern. We're giving one lucky reader a chance to win the Chunky Mesh Wrist Warmers Project Kit pictured below! To enter, leave a comment on this post telling us about your holiday gift knitting (or other crafting) plans! Be sure to also mention your Ravelry ID or email address so that we can contact you if you win. We will announce our lucky winner on our next blog post on Friday, November 25. Good luck!